Puzzle Pal update: now with decoders! I just uploaded Puzzle Pal v1.1.0 to Android Market. 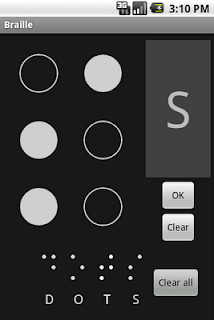 It has a new Decoders menu with three decoders: Braille, Morse Code and Semaphore. All of the decoders have a buffered area to show decoded output, so you can just keep adding new symbols and see what it spells. When you type something in Puzzle Pal, it is usually just a sequence of characters, not a valid word. The Android soft keyboard has auto-correct as default, which can be a bit annoying. Fortunately, you can customize the soft keyboard by specifying the input type of the TextView. setInputType tells the system what you expect as your input. I picked visible password for text because that turns off auto correction. 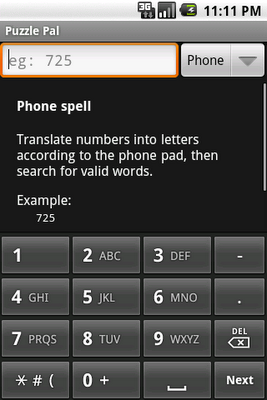 For phone spell, well, it is much more intuitive to offer a phone pad, isn't it?